When Gene Roddenberry created Star Trek in the 1960s, little did he know how big his universe would become. The Star Trek timeline now stretches over hundreds of years, taking in everything from World War 3 (we don’t have too long to wait, apparently), to several attempted invasions by the Borg. 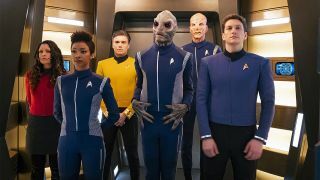 With hundreds of episodes of TV spread across seven different shows – there are at least three more in various stages of development, including a Jean-Luc Picard spin-off – and 13 movies, the Star Trek timeline has become a complex beast. So much so, in fact, that it’s hard to know how the current events unfolding in Star Trek Discovery season 2 fit in with the Original Series, or, say, where Voyager sits relative to The Next Generation crew movies. So we’ve assembled all the key events that shaped Federation history into one massive Star Trek timeline. We’ve even included the parallel “Kelvin” continuity of the J.J. Abrams Star Trek movie and its sequels, an alternative sequence of events kickstarted when a rogue Romulan ship from the future destroyed the USS Kelvin – killing James T Kirk’s dad, George, and forever altering Kirk and Spock’s destinies. 2230 - Spock is born on Vulcan. 2233 - James T Kirk is born. 2263 (KELVIN TIMELINE) - Three years into the five-year mission (with things starting to get boring), the Enterprise is destroyed by Krall’s swarm ships, marooning the crew on an alien planet. It turns out Krall was the captain of the aforementioned USS Franklin, who’s spent the last century using alien tech to keep himself alive – and developing a colossal grudge against the Federation. He’s eventually killed on new Federation starbase, the USS Yorktown. James T Kirk and crew are assigned to a new ship, the Enterprise-A. The original Spock Prime – the one who travelled back in time – passes away on New Vulcan (Star Trek Beyond). 2387 - With a supernova threatening to destroy Romulus, Spock – still active after all these years, remarkably – attempts to save the planet by using “red matter” to create a black hole that will engulf the exploding star. He fails – and he, and Romulan ship the Narada, are sucked into the black hole, and back into the newly created parallel Kelvin timeline. (Star Trek, 2009) Some time in the 3000s (exact year unknown) - Temporal agent Daniels travels back to 2151 to infiltrate Captain Archer’s Enterprise, and overthrow the Suliban plot.